• Authentic U.S. JFK Kennedy Half Dollar, IKE Eisenhower Dollar & Statehood Quarter. The BICENTENNIAL COIN COLLECTION is a colorized 24KT Gold Plated 3-coin set which includes: 1976 Kennedy Half Dollar, 1976 Eisenhower Dollar, and 1976 Washington Quarter. 1975 through 1976, the United States Mint began minting all Quarter, Half Dollar, and Dollar coins with special designs on their reverse, commemorating the 200th anniversary (Bicentennial) of the Independence of the United States. The reverse of the Washington Quarter bore a Colonial drummer and a torch encircled by thirteen stars. The Kennedy Half Dollar coin bore an image of Independence Hall located in Philadelphia. 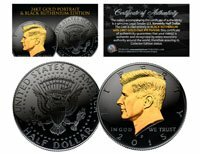 The Ike Dollar coin showed the Liberty Bell superimposed over an image of the Moon. Each coin in this collection is layered entirely in pure 24K Gold and the Bicentennial designs on the reverse of each coin are beautifully colorized to exact specifications by the Merrick Mint. Each set comes with a Certificate of Authenticity that guarantees that your coins are genuine and authentic, and recognized by every monetary authority around the world, therefore assuring there collector edition status. Coin comes displayed in ultra-high premium 4x6 thick holder with full color coin card.